Bulwark - The Power of Advanced Visibility. 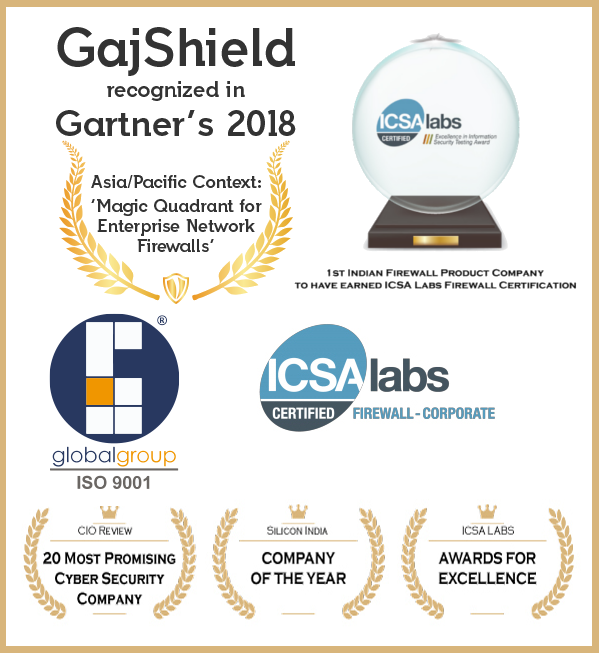 GajShield recognized in Asia/Pacific Context: ‘Magic Quadrant for Enterprise Network Firewalls’ . A mechanism to improve productivity by implementing restrictive application access. Inspection, detect and monitoring of traffic to control the devices been used by employees. Better visibility, control and protection of your business. An integrated, best-in-class and comprehensive cloud functionality by GajShield. Next Generation Firewall & more! Highest standards of products and services. Best in class products and services and complete security solutions tailor made according to the organizational policies, our ICSA Labs' Certification Program provides a complete assurance to our customers about our industry-accepted highest level of security standards worldwide. GajShield is extremely proud to hold key quality management accreditation for the best of breed series of next generation firewalls reassuring our customers that we pursue a process of continuous improvement to provide services and products of highest quality. GajShield awarded 'Company of the Year' 2016 by Silicon India. GajShield honored as among 20 Most Promising Cyber Security Company of 2016 by CIO Review. GajShield wins ICSA Award for Excellence in Information Security Testing. GajShield firewalls are ICSA Labs certified. GajShield, customer satisfaction is our prime goal. We may say all we like about our products and services but the only people whose opinions we value and learn from are our customers. See what are customers have to say about us. Since 4 years GajShield has helped us secure our networks efficiently, it has helped us to manage and track users. The DLP and App policy features have proven to be most useful for us. The most awaited feature, country specific traffic management is finally available. We are using these features for our servers to block unwanted traffic. We are happy about your responsiveness and the help you have provided in securing our network. Before implementing your product, it was not easy for us to identify the security threats and internet bandwidth usage in our university. Your product helped us to pinpoint the misuse of internet through your intense reports. Product is completely worthy in terms of services and features. Also support is available round the clock. Using as a primary gateway for ILL link and we feel secure from outside WORM / Viruses / Ransomwares. Also it helps us to control the usage of internet within office along with the monitoring of user access. The features offered by GajShield appliances were one of its kind. Over and above the support is excellent as per our satisfaction. Committed and dedication of the team is really promising. 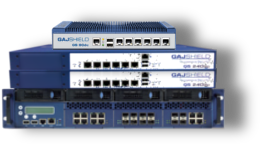 Some really important features of GajShield’s next generation firewall like Content or Web Filtering, Gateway level Antivirus, Bandwidth Management perfectly met our requirements technically as well as commercially. We are extremely satisfied with the security solution you have provided us with. GajShield has proven to be influential in completely securing our network. The features like Bandwidth Management, Gateway level antivirus, Content filtering have provided us with a robust security solution that has safe guarded our network! We are very content with the new security solutions incorporated. The network crashes, unmanaged network and slow download speed problems have been resolved. It’s been 6 years that we are using Gajshield firewall and a lot of changes have been done in our network within the firewall over these years which were customized as per our requirements that improved our system performance and security for good. The reporting mechanism of GajShield is really good. Thorough graphs help us in finding out the actual usage of VLAN bandwidth and also helps us control the unwanted traffic effectively. GajShield matched our requirements perfectly. It is a highly configurable product that does not require in-depth knowledge of networking or firewall techniques. As our security needs continue to grow, the ability to introduce additional functionality, in this modular fashion, to our existing system made GajShield an even more attractive product to have. GajShield’s security solution has helped us in improving our security for the better. We are now assured of our security completely. Our network has also improved in terms of performance and reliability. Ultra Media & Entertainment Pvt. Ltd.
All the security concerns are now successfully managed and improved thanks to the new security solutions by Gajshield. We are completely satisfied with the new security solutions incorporated into our organization. What we liked about GajShield was the approach of integrated security with applications like Stateful Inspection Firewall, IPS, Gateway Anti-Virus, URL Filtering, VPN and Bandwidth Management in one security appliance. GajShield has helped us in achieving the above mentioned goals of ours. GajShield features have helped us greatly in monitoring the data and communication. Our network has become more secured and the overall performance has been optimized. GajShield provided us with complete security solution for our entire organizational network & also made our network more reliable and robust. GajShield helped us in securing our organization by providing all round security with their next generation firewall appliances. They made our network strong and robust which greatly helped us improving our overall performance. One really good thing about the service support is GajShield’s support engineers are always guiding us to make/apply changes in the firewall instead of making changes from their end. This helps us to learn more about the technical aspects which is really commendable. Service has been consistent throughout! GajShield’s Data Leak Prevention functionality greatly helped to secure our network from any potential data leaks. Thanks to GajShield, we have been having a secured & stable internal network for all desktops & servers from the last 7 years & GajShield’s service has been consistent throughout! I’m very impressed with GajShield’s firewall. Everything from its features, services and support is commendable. Keep up with the great work! We would like to appreciate GajShield for their multiple features like the VPN service which has helped us gain a control on the information in the organization, the Intrusion Prevention feature that has greatly helped us to protect Xebia from all kinds of intrusion attacks. GajShield has made managing the security of our network simpler. A lot of issues relating to virus attacks, malware, trojans, spams, etc. were resolved with GajShield’s Anti-Virus feature which led to increased productivity in our organization. After using GajShield’s products and integration, it has made my teams much more productive and efficient. We utilize a host of GajShield firewall features like Bandwidth Management, URL Filtering, Logging, reporting and System Management. Our Organization has been using GajShield’s next generation firewall appliance since 7 years. It has proven to be an ultimate suit for our organization. GajShield’s firewall is very easy to handle and the support and services have also been very prompt throughout in answering all our queries. We are impressed by how GajShield provides an overall security to our organizational network. Now our organization has been completely secured from external threats and internal data leaks. We would specially like to point out towards GajShield’s Support and Service Team which has been providing us with an excellent and timely service. Wishing you a Good Luck. Force Ten Technologies Pvt. Ltd.
Our security has greatly improved and all our network has become extremely easy to manage thanks to GajShield. All the communication can now be easily monitored through detailed reports and graphs. Business continuity has improved significantly! GajShield has helped us in mitigating the external vulnerabilities which have maximized the uptime for the network and IT Resources, as a result of which our business continuity has improved significantly! GajShield effectively helped us devise a strong security solution providing 360 degree control over our organizational network. Thanks to GajShield’s proactive support and assistance, we were able to successfully secure our network. Akash Pack Tech Pvt. Ltd.